Only a small proportion of those found guilty of corruption in Kosovo end up in prison, the 12th court monitoring report produced by BIRN and Internews Kosova finds. Few corruption-related court cases in Kosovo end with a prison sentence, BIRN Kosovo and Internews Kosova’s annual court monitoring report for 2017, presented on Tuesday, said. Since the first such report, 12 years ago, the project has monitored over 10,000 court sessions, revealing important evidence of violations and failings within the judiciary in Kosovo. Introducing the report, Labinot Leposhtica, from BIRN’s legal office in Kosovo, noted that only 32 of 254 court verdicts on corruption in 2017 resulted in prison sentences. In most cases, those found guilty received conditional prison sentences or fines, Leposhtica added. The report outlined numerous instances of light sentences – and of seriously prolonged corruption-related court cases. Leposhtica also drew attention to procedural violations by judges, prosecutors and lawyers, which were witnessed during the monitoring. 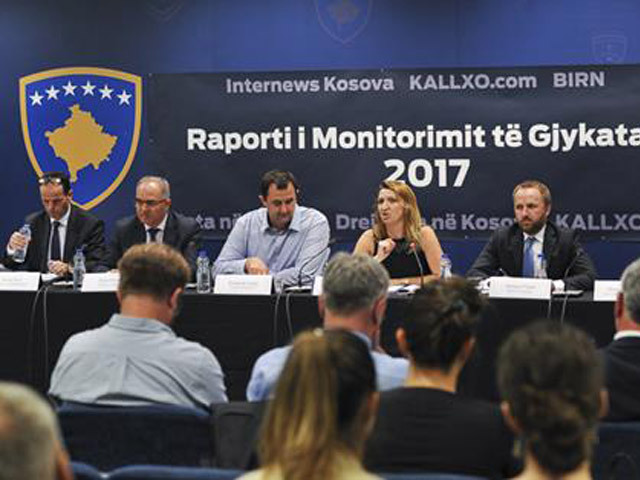 The report was presented at a panel discussion on Tuesday, when the panelists discussed the main findings – including that few corruption cases in Kosovo end in prison sentences. Jeta Xharra, BIRN Kosovo director, said that the past 12 years of court monitoring had revealed both progress and cause for disappointment. She mentioned one notorious case, of Xhabir Zharku, former mayor of Kacanik, who after being convicted in Kosovo simply left the country and did not serve his prison sentence. “The person you refer to is Kosovo’s shame, but such cases will not discourage us from supporting the judiciary. Such cases should not happen again,” Kosovo’s Minister of Justice, Abelard Tahiri, said, responding to Xharra’s words. Tahiri said he saw BIRN as a welcome partner in his own work in the justice system. The head of the Kosovo Supreme Court, Enver Peci, said judges and prosecutors had become more disciplined as a result of BIRN’s monitoring work over the past 12 years. He said it was good that “the courts are not afraid of BIRN any longer; before, people were like, ‘Run! The BIRN people are here’ … whereas now we’ve become more disciplined because of you,” Peci said. Hasan Shala, head of the Court of Appeals, talked about some of the worst flaws in the judiciary. “There are secret compromises between judges and prosecutors,” he admitted. But he also mentioned achievements. “There were 160 cases related to corruption in 2017, 145 of which were closed during the year, so only 15 were left to be finished in 2018,” Shala noted. Nehat Idrizi, head of the Kosovo Judicial Council, agreed with the findings of the report but said they were working hard on evaluating judges who since last year had been assessed by a professional commission. “Last year, we started evaluating the judges’ performances; 66 judges have been evaluated, most of them have received a positive assessment, and only two or three were negative and had to undergo further training,” he said. Idrizi said the low number of judges was a challenge when the number of unfinished court cases remained significant. He also highlighted the lack of supporting staff for judges, arguing that they had an insufficient number of personal aides.